﻿The Bristol﻿ Catholic Chaplaincy has been around in its current form since 1964, when the house was acquired by the Clifton Diocese. Since then a chaplain has been in permanent residence. The chaplain is Fr. Rupert Allen. Our home at 103 Queens Road is the centre for Catholic students and staff of both the University of Bristol and the University of the West of England. Each term we have a full programme of opportunities for worship, formation and socialising. As well as having its own chapel, the Chaplaincy has its own common room, which is accessible to students throughout the day for study and socialising. The Chaplaincy is also home to Cathsoc, the University of Bristol Catholic Society. Led by an annually elected committee, CathSoc provides entertainment and relaxation for its members. 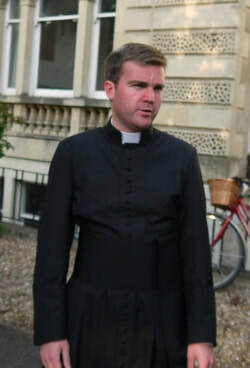 Father Rupert is a native of Bristol and a priest of the diocese of Clifton. He studied theology at the University of Oxford before beginning training for the priesthood. As part of his training he then studied theology, philosophy and canon law at Oxford, London and Louvain (Leuven) and was ordained priest on September 7th 2012. After ordination Fr. Rupert lived and worked in Essex briefly before returning to Belgium where he lived in Leffe and then Brussels. Fr. Rupert returned to England and to Bristol where he has been chaplain since 2015. Fr. Rupert is also priest-in-charge of Holy Cross Parish in Bedminster, Bristol and is pursuing academic work in French ecclesiastical history. You can contact Fr. Rupert here.